This welcoming restaurant and boutique inn is situated in the centre of the beloved North Norfolk town of Wells-next-the-Sea. 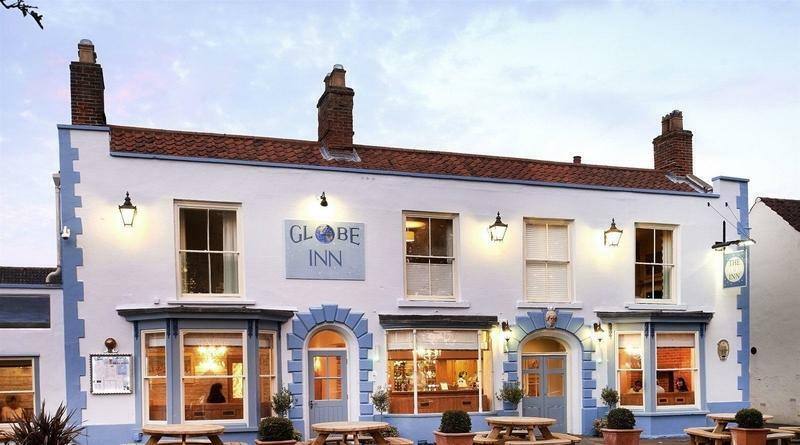 The Globe Inn effortlessly combines the traditional values of inn hospitality with stylish contemporary comfort. The bedrooms reflect the Georgian maritime setting and are individually designed in a contemporary style - tasteful, bright, quirky and fresh. Premium pocket spring mattresses, duck down duvets and pillows, flat screen TVs and fancy Duck toiletries make for a very comfortable stay. The newly refurbished restaurant appeals to diners of all ages and serves modern British classics with a focus on local produce and local flavours. It’s clear that Head Chef Will Jackson and his team love to showcase the very best the region has to offer each season, including beef from the salt marshes, produce from the Holkham Estate and fresh local seafood such as Cromer crabs. In addition to the restaurant, you can also dine in the dog-friendly bar or, in fine weather, enjoy al fresco meals in the historic courtyard. The resident's terrace above is a real sun trap and always has room even when the courtyard is buzzing with customers. The Globe is ideally located a two minute walk from the quayside. The four-mile long strand of Holkham Beach is close by - as are a number fabulous coastal walking paths and world class nature reserves. The Globe has a beach hut for rent to residents for £30 a day on the quiet end of the beach near the pinewoods, dunes and miles of sandy beach - sheer bliss.